I am not a seller at 20. I think the EPS will exceed (ceteris paribus) 2.50 in 2018 now that the junk (KPRL, Segman) has been cleaned out in 2017. We believed this day will come, and it has. Thank you kk, thank you ohana. Very clever guys these brothers. They bought at the right time and stand to make a decent return. This was the canary in the mine. This should have been the trigger for us to buy more. It was unexpected but now we know why it was done. These means supply will be high and i expect demand to be low due to the huge volume of 79 million shares.A very good opportunity for KK shareholders to increase their holdings at low price. Wacheni propaganda, these shares are held in trust as ESOP and will not be offloaded in the market just like that - like next week. Therefore the 79m shares will not affect the current market dynamics. I know you guys are targeting VVS. Where is poor @Obiero? I miss the rascal. Asante but there seem to be some rough waters. Waiting for 12th March 2019. Sold kk last week at 21.75. Bought Safcon at 23.15. My gamble seems to have paid off, at least in the short term. KenolKobil CEO David Ohana deleted selected text messages and call logs just hours before detectives raided his office, the stock market regulator has told the court in the ongoing investigations into suspected insider trading of the oil firm’s shares. Capital Markets Authority (CMA) investigators have in affidavits said they believe that Mr Ohana and Mr Andre DeSimone, the chief executive of stockbrokerage firm Kestrel Capital, got a tip-off on the impending raid, leading them to clean their devices ahead of the raid and seizure of documents. call/SMS logs can be gotten from Safaricom/Airtel. A serious data recovery company would still recover deleted SMS but there is no motivation here. Let's move on. The smartest guys in the room = Kestrel & AKS & Ohana. Perhaps you guys finish reading the story! It says that the deleted messages were retrieved. Bring on the 23/- and we can call it a day! Anyone who has been in the NSE long enough knows how this story will end.I'm just waiting to feast on my 23/= in peace. Though I do not believe Kestrel's DeSimone and KK's Ohana were complicit in the allegations. CMA might just be throwing mud to see what sticks. Even AKS might be a victim of circumstances. I have been a fan of KK for years - through thick and thin, through insults and derision. You know the folks who laughed at me and made fun every time KK had a hurdle to jump but I believed in it. Look at my posts going back many years. What if the timing of a purchase was just before the announcement? I have often said cash is a constraint. What if I happened on some cash and bought KK shares when I could? Currently I am buying Centum given the low P/B, positive comments [investor presentation for 1H 2018-19] and a better 2019 vs 2018. Cash remains a constraint BUT after KK's cash checks in I plan to buy more Centum. Suppose just after my purchase of Centum (after the KK cash is in) there is a takeover announcement or other significant news - a sale of Two Rivers or Vipingo for cash to a foreign investor eg Old Mutual - am I complicit in Insider Trading? We need to know more but not through half-baked articles in the BD. Even when CMA finds anyone guilty of breaking the rules it has a history of giving paltry fine amounts like 50k.I also second you about the BD article.Mainstream media as a whole is dead.All they do nowadays is sell sensational headlines with little to no resources devoted to research. My gut feeling is someone from CMA is leaking selective information to BD but not the whole truth. How did BD find out about the seized phones? Just as the finer details revealed in the article. Perhaps, it is not in the interest of AKS, Ohana and DeSimone to have this info out there even if they are innocent given the stress and reputation risk. So who benefits from the leaks? Of course, I want this deal over and done as soon as I made peace with selling my shares. The three conspired and they'll just get a slap on the arm. not through half-baked articles in the BD. How do you know that they conspired for a fact? 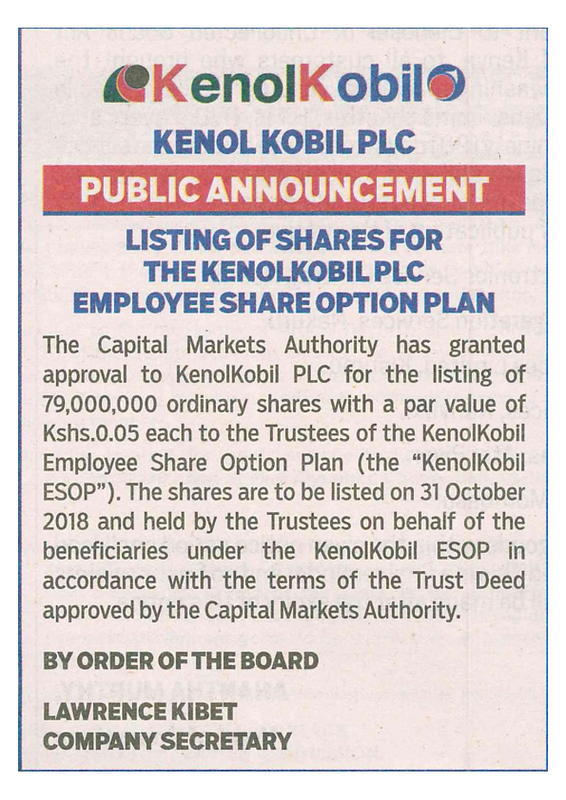 I was reading in a news some time ago that one French company is preparing tender offer to acquire Kenol Kobil. Proposed price was 23. Does anybody have any information on this topic, especially considering freeze of some accounts?